My journey began on January 1, 1998 when I attended my first Cotton Bowl game (in the original Cotton Bowl stadium). That game featured Texas A&M and UCLA. I attended another Cotton Bowl game in the original Cotton Bowl stadium on January 1, 2005. That game featured A&M and Tennessee, and was the last time Texas A&M played in the original Cotton Bowl stadium. In fact, January 2, 2009 was the last time the Cotton Bowl game was played in the original stadium, and unless they move the game back to the old stadium, there may not be another chance to see A&M play there. Tulane stadium stood from 1926 to 1980 and hosted the first Sugar Bowl game on January 1, 1935. The last Sugar Bowl hosted there was on December 31, 1974. While Texas A&M did play a Sugar Bowl game in Tulane stadium on January 1, 1940 (winning the 1939 AP National Title), I was not yet alive to see it. Further, as previously stated, the Sugar Bowl game left Tulane stadium in 1974, a few years before I was born. However, Texas A&M did win the Big 12 Championship during my senior year at A&M. That championship earned A&M an invitation to play Ohio State in the January 1, 1999 Sugar Bowl game. While there was no Sugar Bowl stadium, I did get to see A&M play in a Sugar Bowl. The first Orange Bowl game was played on January 1, 1935. However, the Orange Bowl stadium wasn’t built until 1937. In 1959, the stadium was renamed after the Orange Bowl game and became the Orange Bowl stadium. The “OB” was raised (or demolished) after the 2007 season (in January of 2008). If I remember correctly, there was an announcement that the 2007 season would be the Orange Bowl stadium’s last. For this reason, I made plans to attend the September 20, 2007 regular season game between A&M and Miami, as I knew it would be my only chance to see A&M play in the original Orange Bowl stadium before it was gone forever. Other than 2007, A&M played in that stadium only one other time. That one other time was on January 1, 1944 when A&M played in the Orange Bowl game. 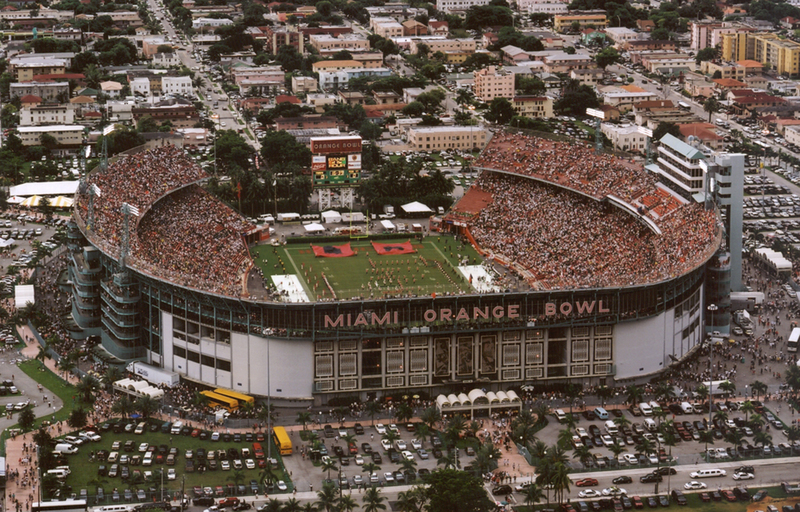 However, at that time, the stadium had not yet been named the Orange Bowl. The first Rose Bowl game is said to have been played in 1902, although at the time, the game had not yet been named the Rose Bowl. The game in Pasadena California that traditionally matches teams from the East and West has been played annually since 1916, and the Rose Bowl stadium was built in 1922-23. On January 1, 1923 the first game titled as the Rose Bowl game was played in the brand new Rose Bowl stadium. Texas A&M has never played in the Rose Bowl game or the Rose Bowl stadium. They have traveled to play UCLA in California before, but have not done so since UCLA made the Rose Bowl stadium their permanent home. Due to the Rose Bowl game’s strict allegiance to tradition, it has always been difficult for non PAC-12 or Big 10 conference teams to earn an invitation (by choice) to play in the Rose Bowl game. If not for the Rose Bowl game entering into arrangements like the Bowl Championship Series (BCS), and thus giving away some of its autonomy, several teams that have recently had the opportunity to play in the Rose Bowl game (due to the National Championship / BCS rotation) would not have had such an opportunity. In other words, unless you are playing for the national title in a year that happens to also place you in the Rose Bowl, then your best chance of getting a Rose Bowl invitation is by joining either the PAC-12 or Big 10 conference. Considering that A&M will most likely never be in one of those conferences (at least not in my lifetime), this weekend’s regular season game between A&M and UCLA (on September 3, 2017) is my first, and possibly only, chance to see A&M play in this historic venue. For this reason I am currently writing this from my seat aboard a Southwest Airlines flight in route to Los Angeles, California. It took almost 20 years, but I will officially be able to say that I have seen the Aggies play in all three of the most historic original bowl venues (only one of which is still in use for that purpose) and the Sugar Bowl game. It is fitting that it ends this way, at the “Grandaddy of them all” and against UCLA; who (for me) it started with in Dallas, Texas on January 1, 1998. It is done. The superfecta is complete. I can now say that I have seen Texas A&M play in all four of the above-mentioned bowls and/or venues. While my experience at the Rose Bowl stadium was surreal, amazing, and historic; it wasn’t just the venue that made it so. The game itself was also historic due to the fact that Texas A&M blew a 44-10 lead which they held late in the third quarter. I won’t rehash the game here, but if you care to, you can read about it in every major (and minor) college football media outlet as everyone in the country took note (OCRegister.com; SBNation.com; Dallas Morning News; L.A. Times; and ESPN.com). For UCLA, it was one of the greatest comebacks in history, as the Bruins overcame a 34-point deficit to win by one point. UCLA’s comeback registered, and stands alone, as the second-biggest in college football history, joining a list of games in which the winning team trailed by at least 30 points before winning. I would also like to point out that while I have seen Texas A&M play in all the above-mentioned bowl games and venues, none of these games were victories for the Aggies. Both Cotton Bowl games, the Sugar Bowl game, and the regular season games in both the Orange Bowl and Rose Bowl stadiums, were all loses. This entry was posted in 2017, Bowls, History, Texas A&M, TN and tagged Grand Slam, superfecta by Travis Normand. Bookmark the permalink.